Optional – Java, SQL and jOOQ. Our recent article “NULL is Not The Billion Dollar Mistake. A Counter-Rant” got us a lot of reads, controversial comments, and a 50/50 upvote / downvote ratio pretty much everywhere a blog post can be posted and voted on. This was expected. Objectively, NULL is just a “special” value that has been implemented in a variety of languages and type systems, and in a variety of ways – including perhaps the set of natural numbers (a.k.a. “zero”, the original null – them Romans sure didn’t like that idea). // Nothing can be put in this list, right? // This compiles, but does it run? A lot of Java 8’s Optional‘s interesting history has been dug out by Nicolai Parlog on his excellent blog. Some collections allow null elements, which means that you cannot unambiguously use null in its otherwise only reasonable sense of “there’s nothing there”. If/when some of these APIs are extended to primitives, there is no value to return in the case of nothing there. The alternative to Optional is to return boxed types, which some people would prefer not to do. Some people like the idea of using Optional to allow more fluent APIs. Some people are happy to create an object for the sake of being able to do this. Although sometimes less happy when they realize that Optionalism then starts propagating through their designs, leading to Set<Optional<T>>’s and so on. It’s hard to win here. Arguably, the main true reason for the JDK to have introduced Optional is the lack of availability of project valhalla’s specialization in Java 8, which meant that a performant primitive type stream (such as IntStream) needed some new type like OptionalInt to encode absent values as returned from IntStream.findAny(), for instance. For API consistency, such an OptionalInt from the IntStream type must be matched by a “similar” Optional from the Stream type. Can Optional be introduced late in a platform? If this map permits null values, then a return value of null does not necessarily indicate that the map contains no mapping for the key; it’s also possible that the map explicitly maps the key to null. The containsKey operation may be used to distinguish these two cases. This is how much of the pre-Java 8 collection API worked, and we’re still using it actively with Java 8, with new APIs such as the Streams API, which makes extensive use of Optional. Boom, NullPointerException. Can you spot it? The map contains remainders of a modulo-5 operation as keys, and the associated, collected dividends as a value. We then go through all numbers from 0 to 5 (the only possible remainders), extract the list of associated dividends, List::size them… wait. Oh. Map.get may return null. You’re getting used to the fluent style of Java 8’s new APIs, you’re getting used to the functional and monadic programming style where streams and optional behave similarly, and you may be quickly surprised that anything passed to a Stream.map() method can be null. Backwards compatibility will lead to a mediocre adoption of Optional. Some parts of JDK API make use of it, others use null to encode the absent value. You can never be sure and you always have to remember both possibilities, because you cannot trust a non-Optional type to be truly “@NotNull“. The domain object establishes an “Optional opt-in” contract, without opting out of null entirely. While getFullname() forces API consumers to reason about the possible absence of a full name, setFullname() doesn’t accept such an Optional argument type, but a nullable one. What was meant as a clever convenience will result only in confusion at the consumer site. From there on, your code-base should no longer use the simple non-Optional Type type for 0-1 cardinalities. Ever. A short while ago, I gave this answer on Quora. The question was “What is the significance of NULL in SQL?” and most of the existing answers went on about citing C.J. Date or Tony Hoare and unanimously declared NULL as “evil”. So, everyone rants about NULL all the time. Let me counter-rant. Of course, academics like C.J. Date will rant about NULL (see Greg Kemnitz’s interesting answer on Quora). Let me remind you that C.J. Date also ranted about UNION ALL, as pure relational theory operates only on sets, not on bags (like SQL does). While in theory, sets are probably much purer than bags, in practice, bags are just very useful. These people probably also still mourn over the fact that SQL (useful) won over QUEL (pure), and I don’t blame them. Theory is always more beautiful than the real world, which is exposed to real world requirements. There are also other kinds of purists who will run about and educate everyone about their black/white opinions that leave no room to “it depends…” pragmatic approaches. 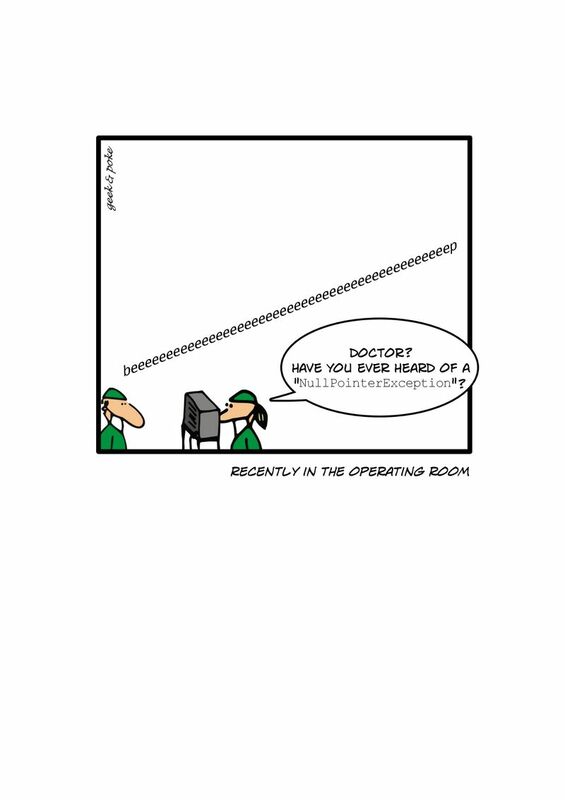 I like to display this witty comic strip for such occasions: New intern knows best: GOTO. Purists like extreme abstraction when they describe their world, and such abstraction asks for very simple models, no complexity. NULL adds tremendous complexity to the SQL “model”, and does thus not fit their view. Functional programming languages like to make use of the Optional “monad” (see Mario Fusco’s excellent explanation of what a monad is) to model the 0 or 1 cardinality, but that’s just another way of modelling NULL. The (possibly) absent value. Perhaps, if you like to discuss style (then you should read this), NULL vs. Optional may matter to you, but they’re really exactly the same thing. We’ve just been shifting whitespace and curly braces. The only way to really do without the absent value would be to disallow the optional cardinality and use 0 .. many instead, which would be much less descriptive. So, regardless of what purists or academics say about a perfect world, we engineers need potent tools that help us get our work done, and NULL (or “Optional” is one of these potent tools that allow us to do so. It’s not like there weren’t any alternatives. SQL, for instance, implements a more expressive but probably less intuitive three-value logic, which most developers get wrong in subtle ways once in a while. At the same time, SQL doesn’t know “NULL” results, only “NULL” column values. From a set theory perspective, there are only empty sets, not NULL sets. Other languages allow for dereferencing null through special operators, letting the compiler generate tedious null checks for you, behind the scenes. An example for this is Groovy with its null-safe dereferencing operator. This solution is far from being generally accepted, as can be seen in this discussion about a Scala equivalent. Scala uses Option, which Java 8 will imitate using Optional (or @Nullable). To me, nullability isn’t a first-class citizen. I personally dislike the fact that Scala’s Option[T] type pollutes my type system by introducing a generic wrapper type (even if it seems to implement similar array-features through the traversable trait). I don’t want to distinguish the types of Option[T] and T. This is specifically true when reasoning about types from a reflection API perspective, where Scala’s (and Java’s) legacy will forever keep me from accessing the type of T at runtime. Of course there would be a couple of caveats and the above choice of method names might not be the best one. But being able to deal with single references (nullable or non-nullable) or array references (empty, single-valued, multi-valued) in the same syntactic way is just pure syntax awesomeness. Null-checks would be replaced by length checks, but mostly you don’t even have to do those, because each method would always be called on every element in the array. The current single-reference vs. multi-reference semantics would be documented by naming conventions. Clearly, naming something “orders” indicates that multi-references are possible, whereas naming something “customer” indicates that multi-references are improbable. As users have commented, this technique is commonly referred to as array programming, which is implemented in Matlab or R.